When ordering a modular wheelchair ramp there are many questions that need to be answered. Recently, I've had a lot of requests for information on modular ramps and have decided to create this page to help answer questions for people who know what they want but need help figuring out what features are needed, or available. Modular ramps are available from your local home health care stores and some of our advertisers. Ramp Slope is pretty easy. 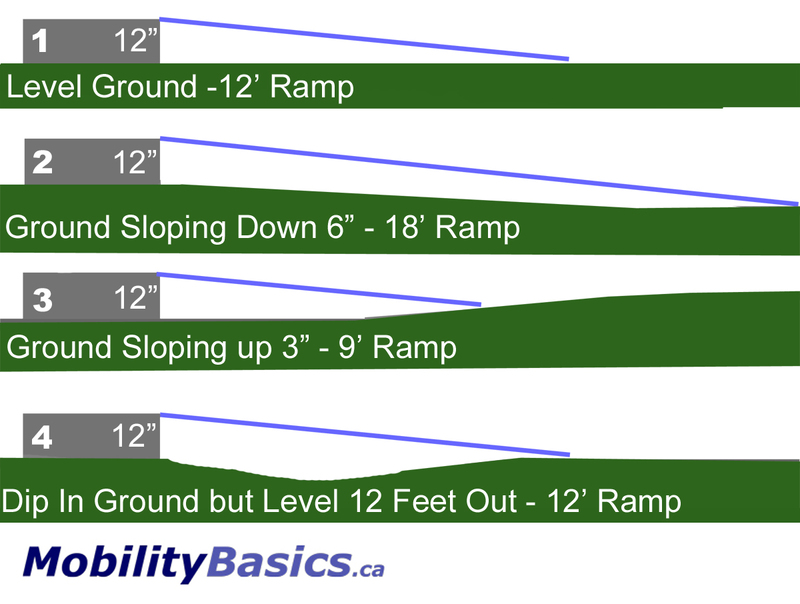 The building code and accessibility codes require 12" of ramp for each 1" of rise. While this slope is perfectly fine for most power wheelchair and scooters, people with manual wheelchairs will have to do a bit of work to climb the ramp, especially if it's a long one. 12:1 is okay but 16:1 or 20:1 might be better for those who are lacking strength or stamina. Ramp length is also pretty easy. Working with a 12:1 slope, if your porch is 12" high, you need a 12' ramp. As long as the ground is level, this works fine but if the ground slopes towards the porch or away from the porch it will throw off your length requirement. If the ground slopes away, then the rise of the porch will be the difference between where the ramp starts and the top of the porch. The porch might be 12" high but if the ground slopes down 6" from the porch 12' out, the rise is actually 18". Theoretically, if the ground continually slopes away from the porch you may never be able to get a ramp long enough to give you the correct slope. In such cases you have two options, get a porch lift or re-landscape the ground so the slope is minimized. If the ground slopes up from the porch as in example 3, you can get a way with a shorter ramp and still have a 12:1 slope. If it slopes up quickly to the height of the porch you's basically have a bridge instead of a ramp at all. Finally, if the ground dips down and then comes back up to the same level as the at the porch then you're back to a 12' ramp. Modular ramp systems require a top landing of some sort. That can be a new or an existing porch or deck or a top landing can usually be ordered as part of the modular system. Most codes require the landing to be a minimum of 60" x 60" and extend a minimum of 12" beyond the door on the door handle side. Depending on the ramp model, stairs may also be available from the ramp manufacturer for those who don't need to use the ramp. In situation where there is not enough space to set up a long modular ramp system, the area needed can be reduced by putting a turn in the ramp. a ninety degree turn is a right angle turn and the landing used to make the turn must be level and 60" x 60" minimum. By mixing and matching the ramp sections the turn landing can be anywhere along the length of the ramp that works best. Some modular ramp systems use a 180 degree turn, sometimes call a switchback turn, where the ramp user travels up the ramp, makes the turn and continues up the ramp but facing the opposite direction. The turn landing for the 180 turn mus be a minimum of 60" x 96" and in some cases 60" x 10'. 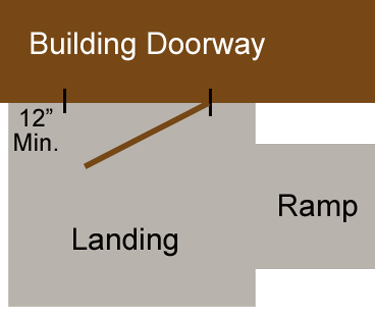 Intermediate landings are level areas somewhere along the length of the ramp where the ramp user can rest. Building and accessibility codes require one landing for every 30' of ramp. So, if your ramp is 40' long, you need to put the intermediate landing somewhere no more then 30' feet form either end. It could be half way or closer to one end. Depending on your local codes, an intermediate landing can be just a level section of ramp 60" long or they may require a full 5' square landing. If there is a turn in your ramp, it will have to be level and can be used in place of an intermediate landing. Any ramp with more than a 6" rise must have railings to meed building codes. 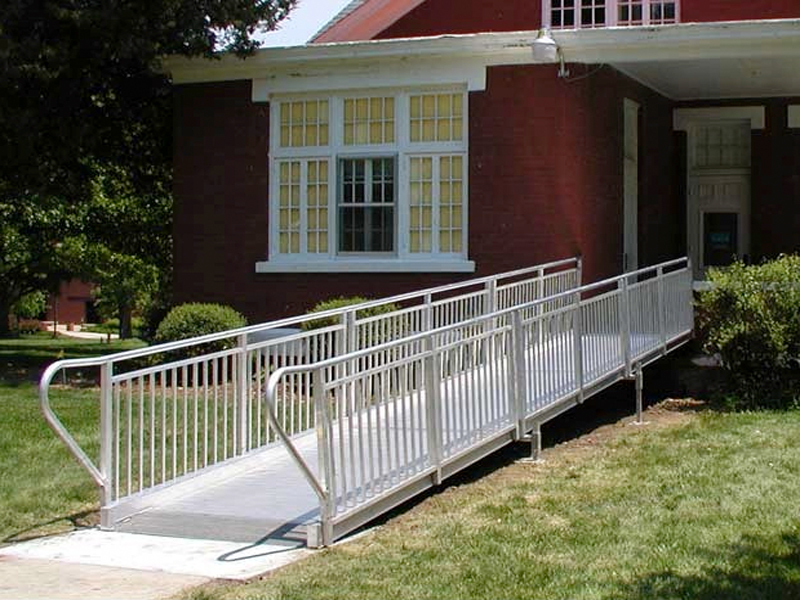 Modular ramp systems include railings on both ramp sections and landings. Open tubular railings usually are simple railings that consist of uprights at specific intervals and tow horizontal tubes at regulated heights. The size of the tubes are also regulated. The picket railings consist of a series of vertical pickets and a top rail for gripping. Picket spacing is regulated by codes. Usually 4" or less to prevent people from getting eentrapped by them. Some of the more stringent building codes require the railings be able to withstand a force of 200 pounds in any direction without bending or being damaged. The picket railings are usually more able to withstand these forces. Modular ramps are excellent solutions for those who don't want permanent ramps and will benefit for systems that can be disassembled and moved, or sold when no longer needed. Below are the steps I'd recommend for those considering purchasing a modular ramp system. Most modular ramp vendors will be more than happy to help you work through the steps needed and provide documentation, if needed.